Hydrangea macrophylla Miss Saori (‘H20-2’) has been crowned winner of the 2014 RHS Chelsea Plant of the Year award. The plant, originally bred in Japan, catches the eye with its vivid colours and unusual double-petalled flowers. 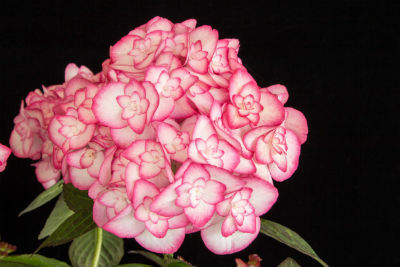 The Hydrangea macrophylla Miss Saori (‘H20-2’) was announced as the winner following a 90-second pitch by Chris Campbell, a representative of Javado Plants of behalf of Hillier Nurseries and Garden Centres. Iris ‘Domino Noir’ from Cayeaux Iris came in second place with Gerbera Garvinea Sweet Glow from The Scotts Miracle-Gro Company took third. The RHS Chelsea Plant of the Year recognises the most inspiring new plant at the Chelsea Flower Show and the winner is picked from a shortlist of 20 plants chosen by a panel that includes Plant Committee Chairs, RHS Garden Curators and the RHS President, Elizabeth Banks.